Elkins City Hall is located at 401 Davis Avenue, Elkins, WV 26241; phone: 304-636-1414. 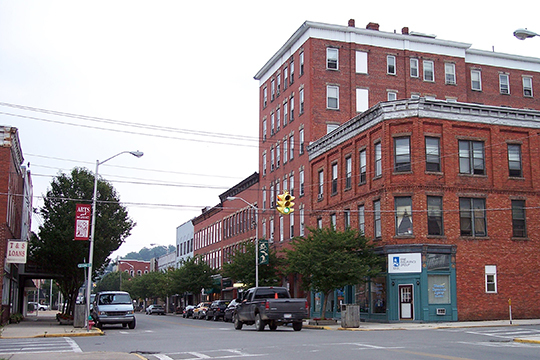 Photo: Davis Avenue in downtown Elkins, West Virginia, Downtown Elkins Historic District. Listed on the National Register of Historic Places in 1995. Photographed by user:Tim Kiser 2006, [cc-by-2.5 (creativecommons.org/licenses/by/2.5/deed.en)], via Wikimedia Commons, accessed January, 2013. When Elkins was first incorporated in 1890, a petition was presented to the county court to make Elkins the county seat, then located at Beverly. The court refused as they were then in the process of replacing the courthouse. In 1897 the new courthouse burned to the ground and Elkins again petitioned the court. By that time, Elkins had become the center of many business interests, such as coal and timber, that had regular dealings with the county court. The issue was placed on the ballot during the general election of 1898, but the results were disputed. When the county court found in favor of Beverly, Elkins appealed to the circuit court and won. The appeal eventually went before the State Supreme Court which decided in Elkins' favor. A new courthouse was begun in 1902 on the corner of Randolph Avenue and High Street and completed in 1908. The struggle to locate the county seat in Elkins parallels many county seats throughout the state of West Virginia. Elkins also became headquarters for the federal district court for northern West Virginia in 1921. Elkins contributed to the development of the county by being the location of the center of commerce, transportation, and banking. The arrival and development of the railroad was the single most significant development in Elkins' history. The history of Elkins revolves primarily around two self-made businessmen and politicians, Henry Gassaway Davis and his son-in-law, Stephen Benton Elkins. They originally founded the town of Elkins as the main terminal on their West Virginia Central & Pittsburgh Railway. Henry G. Davis was born on a farm near Baltimore in 1823. The son of Caleb Davis, a merchant with interests in the expanding railroad that was being extended to Frederick. In the Panic of 1837, Caleb Davis lost everything, and Henry, then 14 years old, went to work to help support the family. When he was 20, Henry was hired as a brakeman on the B&O. He impressed the directors with his innovations and skills and was soon promoted to conductor. He is credited with being the first to operate trains at night, a feat considered impossible at the time. In 1853, Davis was made agent at Piedmont, now in West Virginia, probably the most important B&O station outside Baltimore. Piedmont was located at the point where lighter engines were exchanged for heavier, more powerful engines to negotiate the 17 mile grade to the top of the Alleghenies. This year marked the end of Henry Davis' career as a B&O employee and the beginning of his corporate career. Elkins proper did not come into existence until the interests of Davis and his son-in-law, Stephen Benton Elkins, were turned towards this section of West Virginia. They identified the potentially rich Roaring Creek coal fields in Randolph County and laid out a rail route to these resources. The terminus was Leadsville/Elkins. Elkins was to construct a home near the railroad in order to keep an eye on their investments. "Halliehurst" was thus begun in 1889. The following year Davis began construction on his home on an adjacent hill.